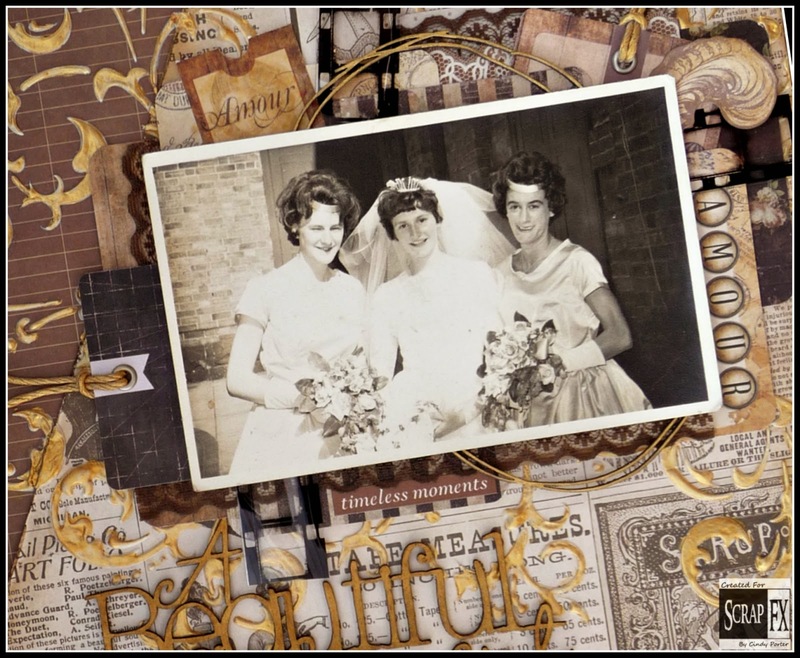 I have been creative all my life... and love how the Scrapbooking industry allows me to combine so many of my creative outlets... 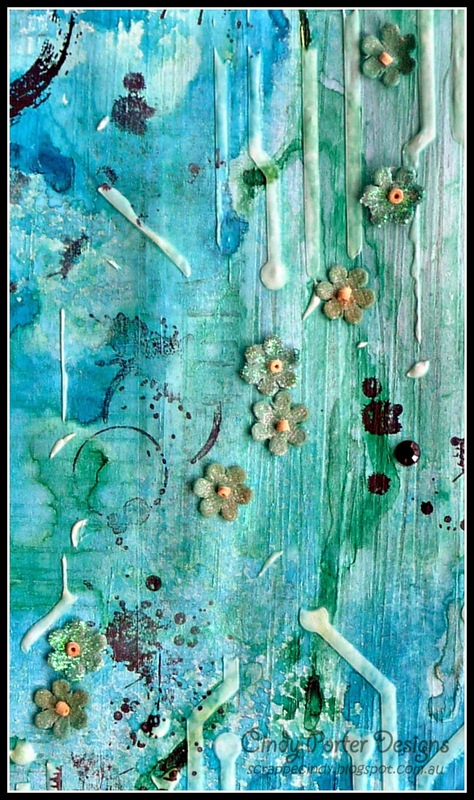 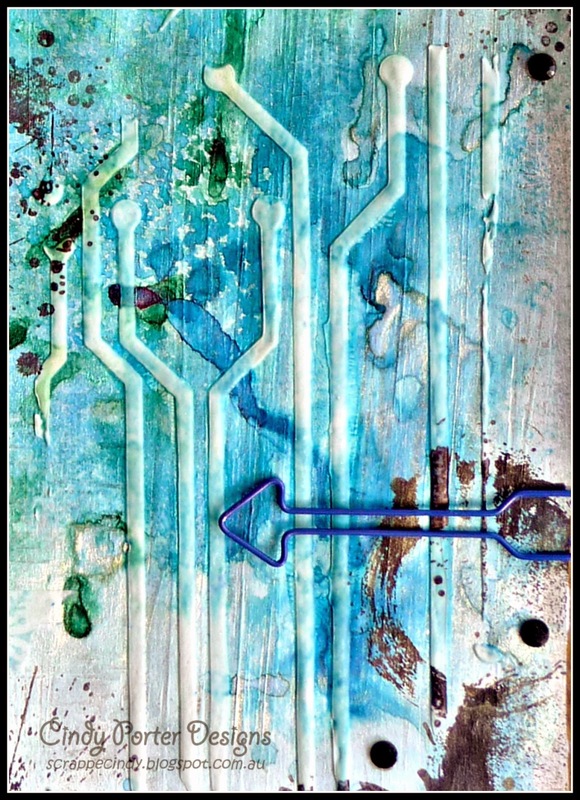 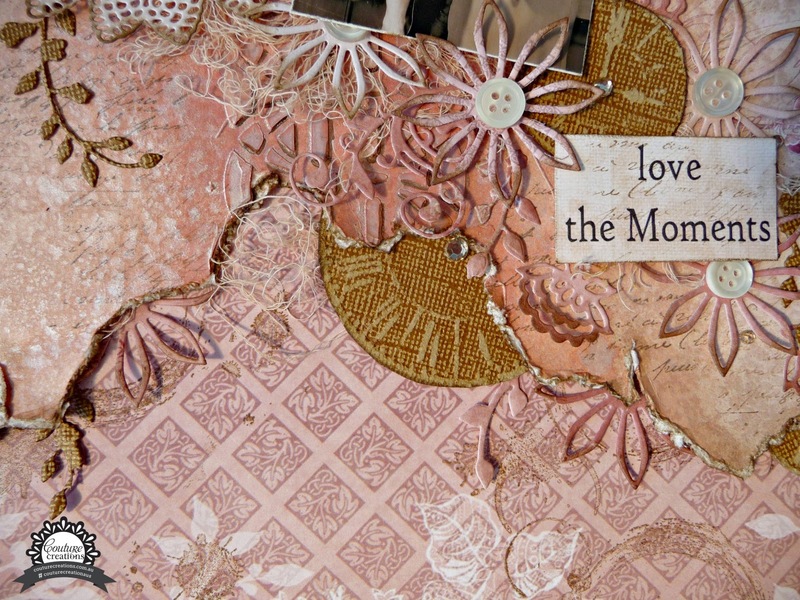 I love Mixed Media and design work, along with teaching. 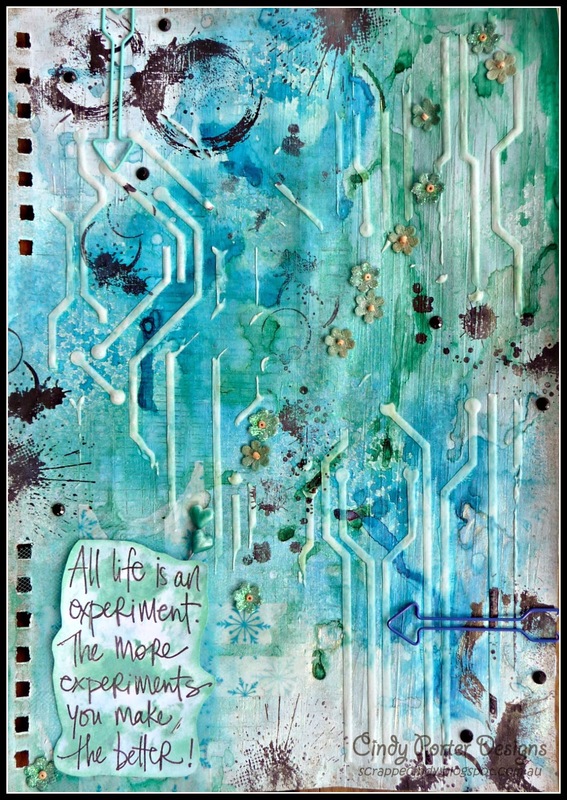 My Mantra is Create and Educate. 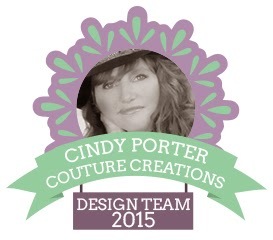 Over the years I have had the privilege of becoming a Fully Certified Ranger Educator, Copic Certified Instructor/Designer, and published designer. 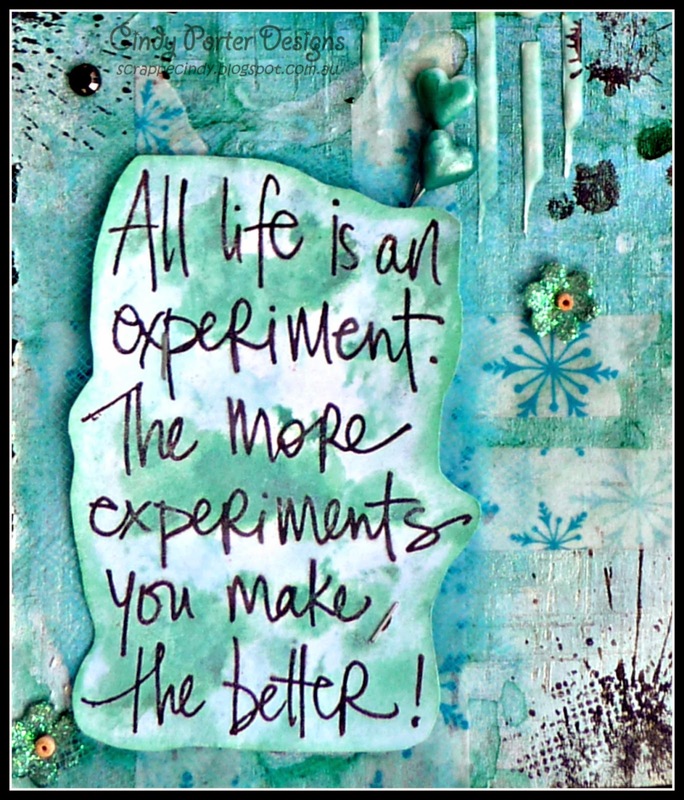 I have had the privilege to teach in Australia for many years, and have been lucky enough to teach overseas on numerous occasions. 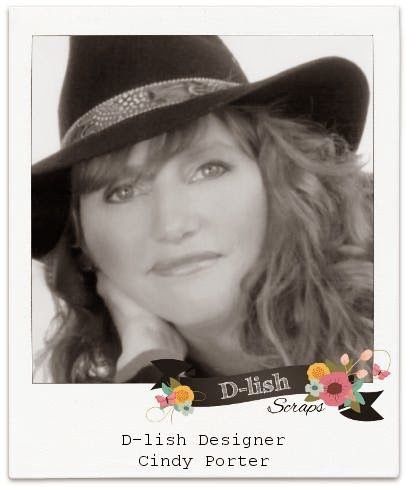 I have had the honour of being on several design teams, and apart from D-lish Scraps, I am currently on the Scrap FX design team and the Couture Creations design team. 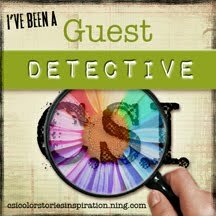 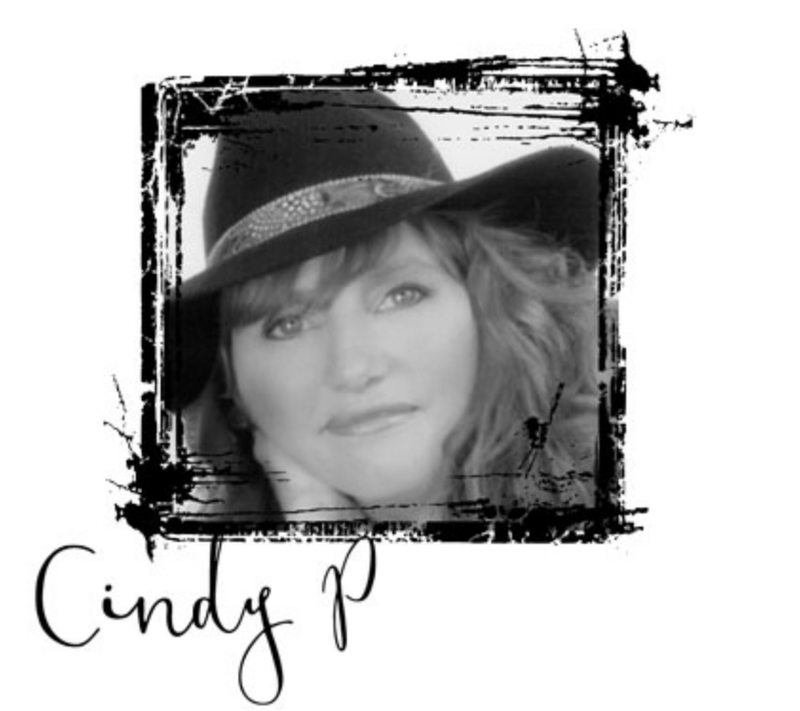 Hi everyone, it's Cindy here with my second blog post for the month.... 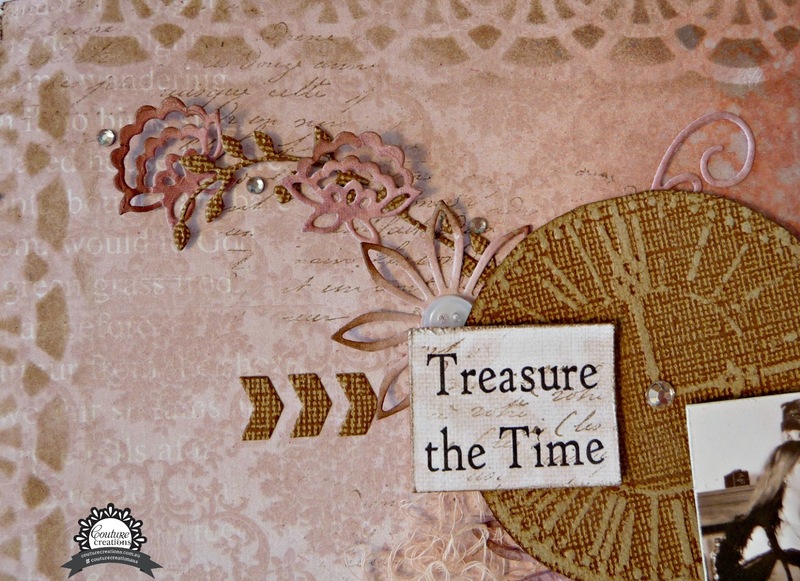 I'm excited to share my second project using the fabulous Vintage Rose Paper collection and some of this years gorgeous die releases. 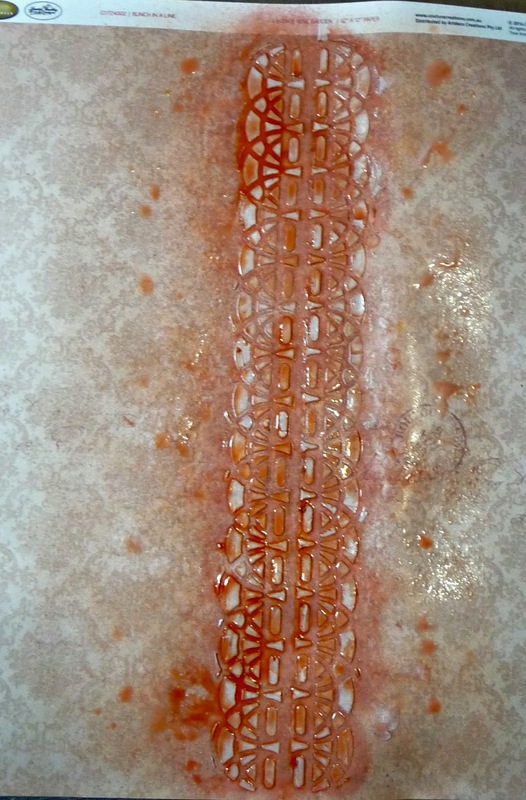 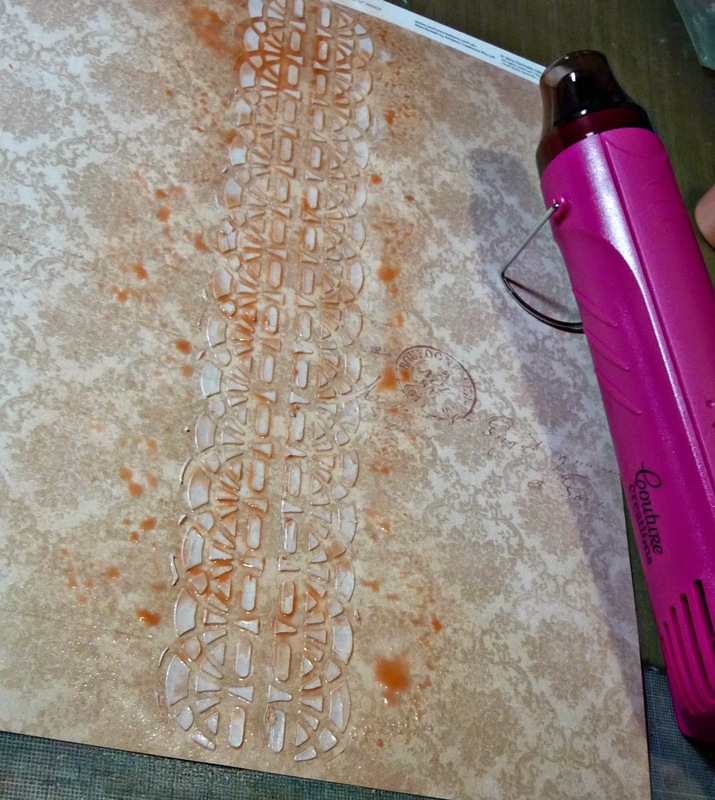 After drying the stencilled modelling paste with the heat tool, I then spritzed a couple of different coral sprays drying in between colours with the heat tool. 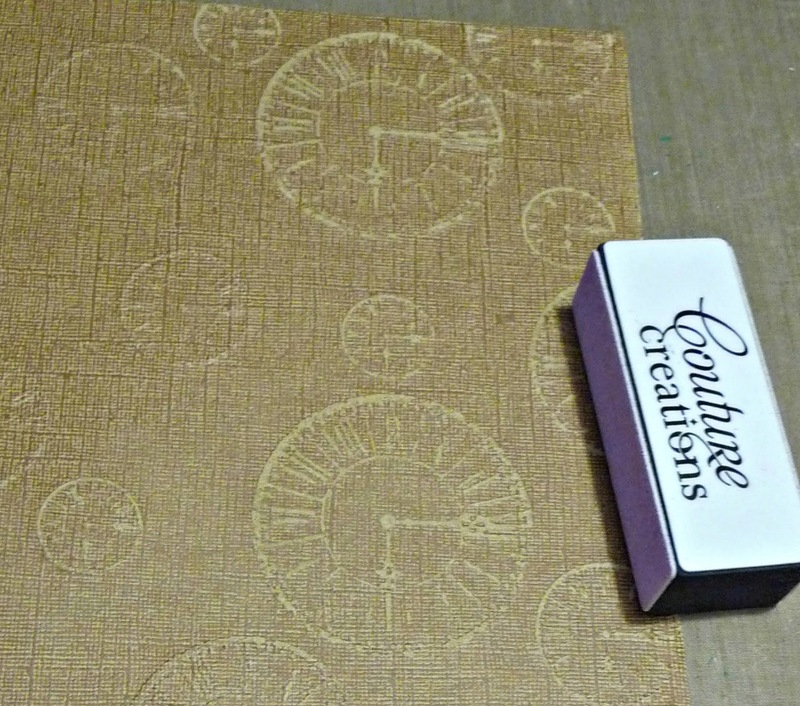 I used a sheet of the Coordinations cardstock and sanded it back to reveal the clocks pattern, I fussy cut several different size clocks. 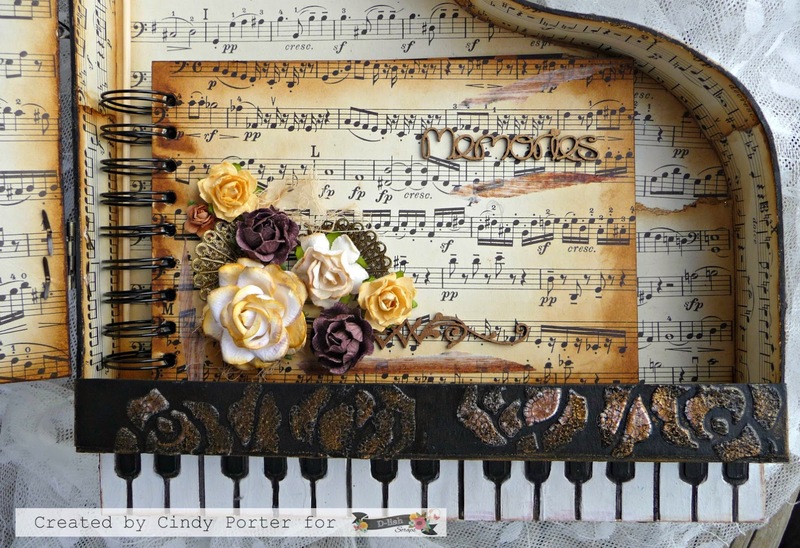 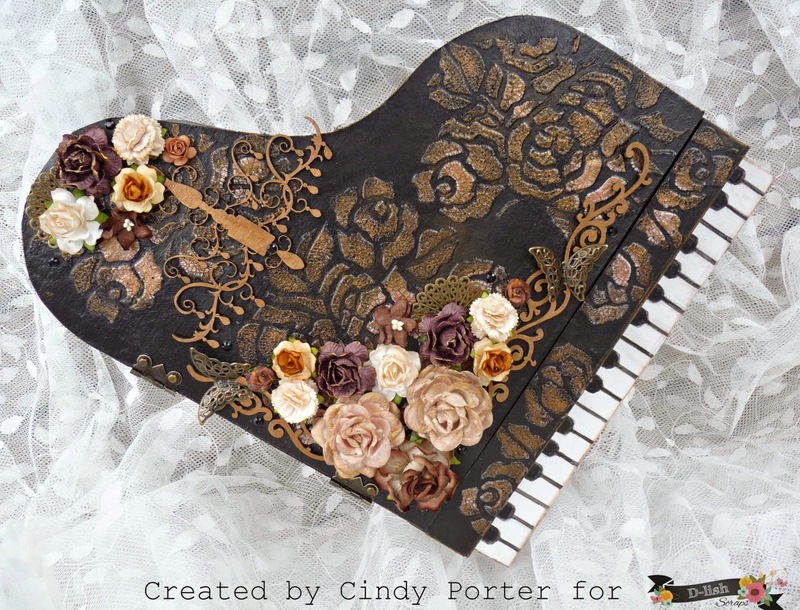 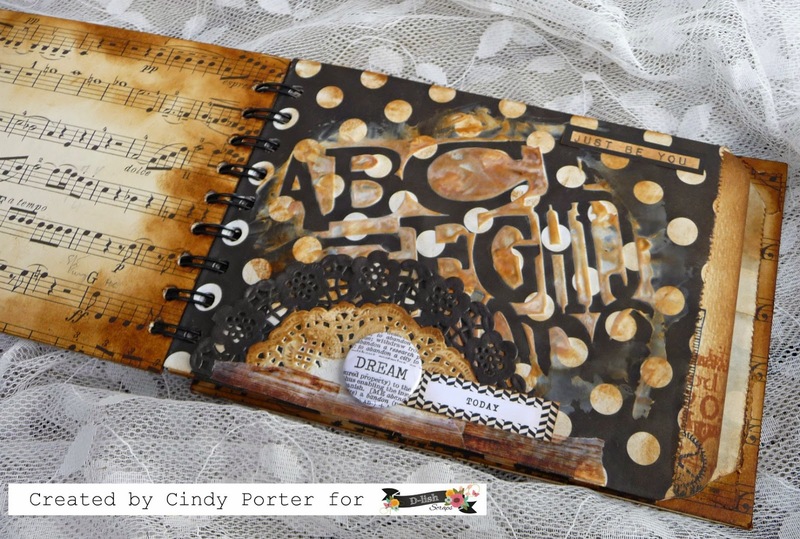 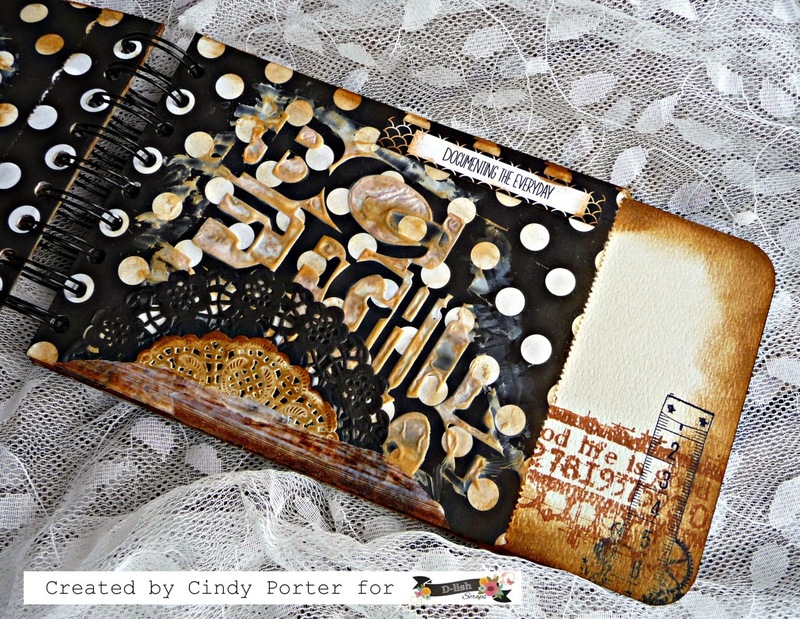 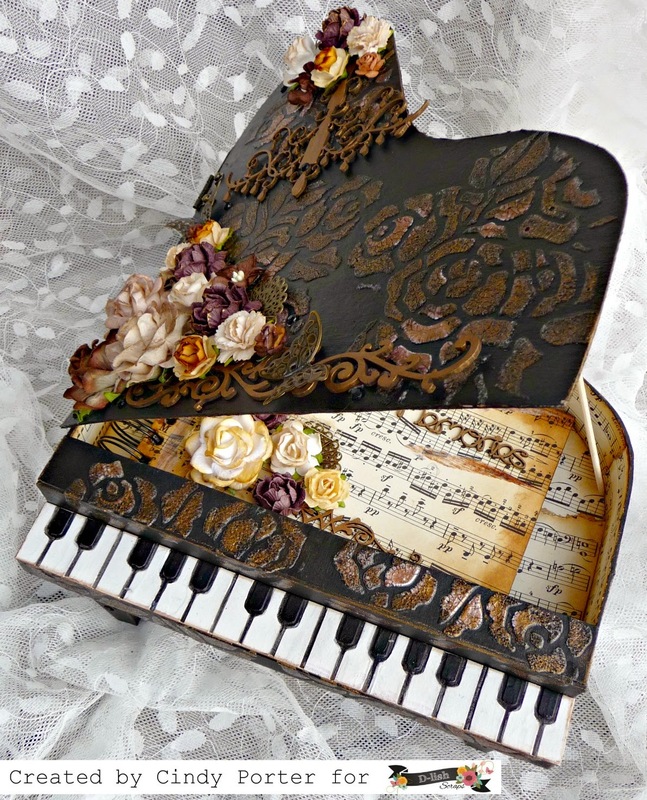 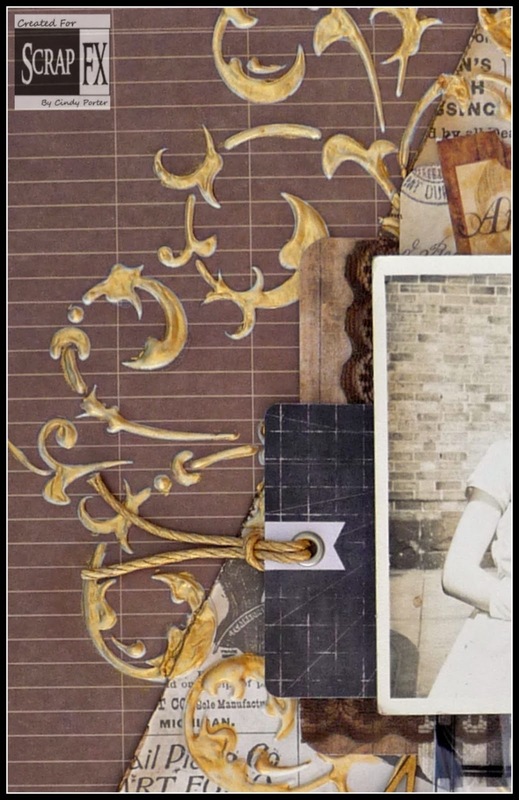 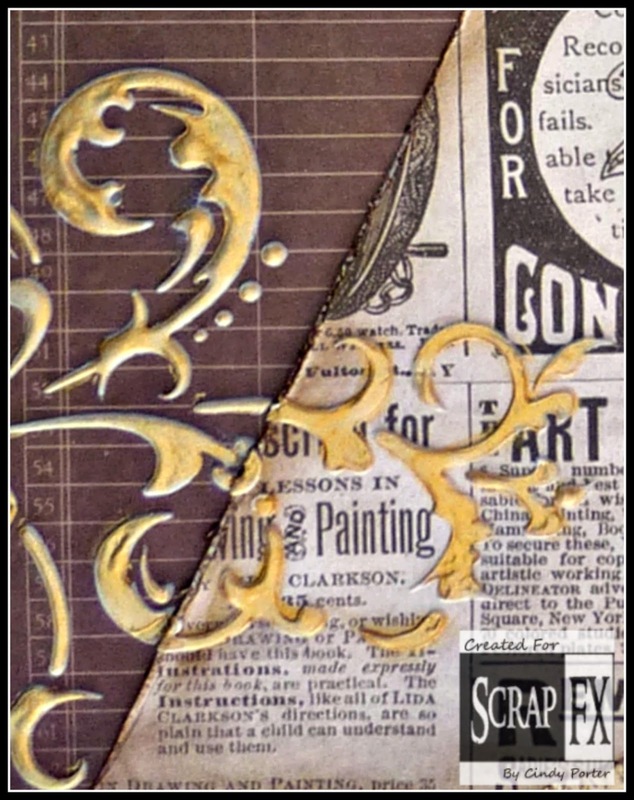 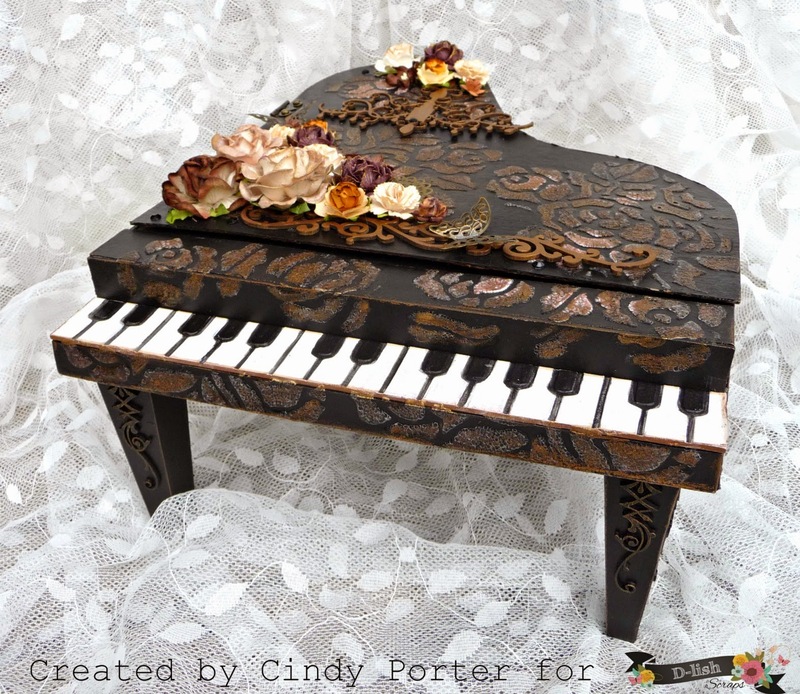 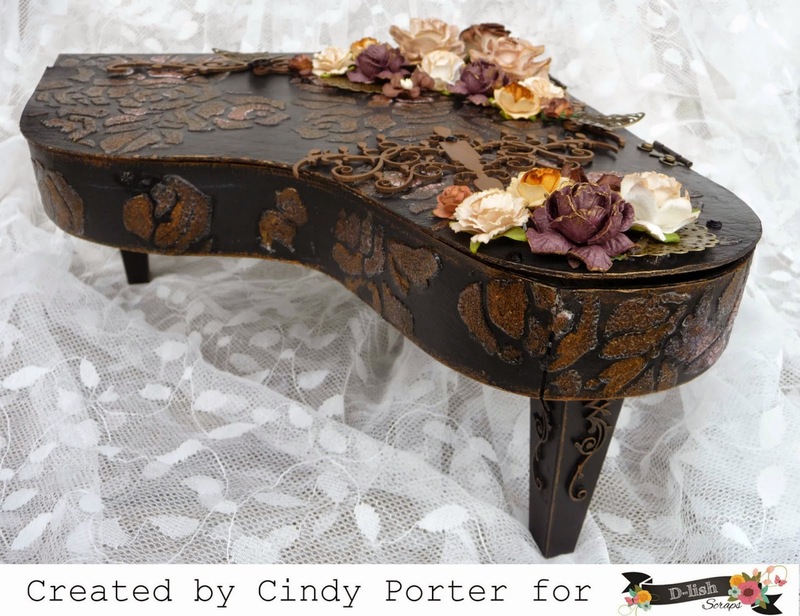 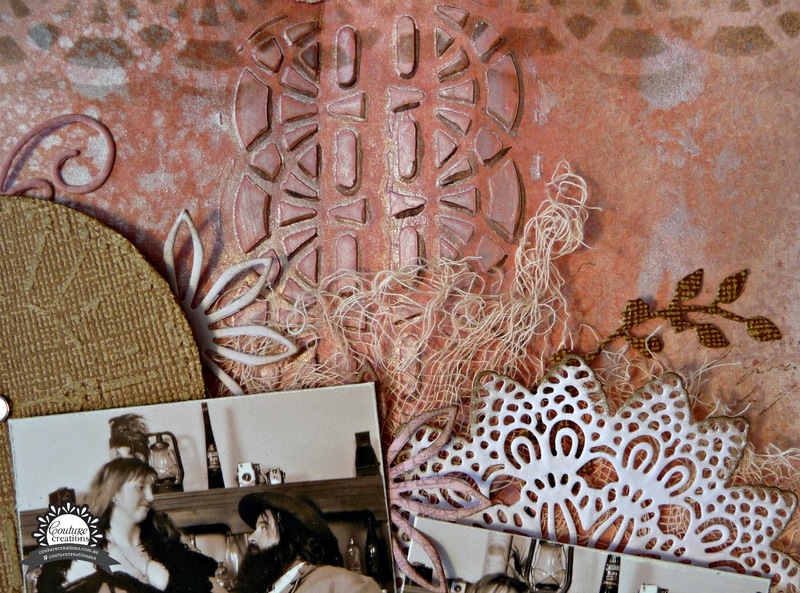 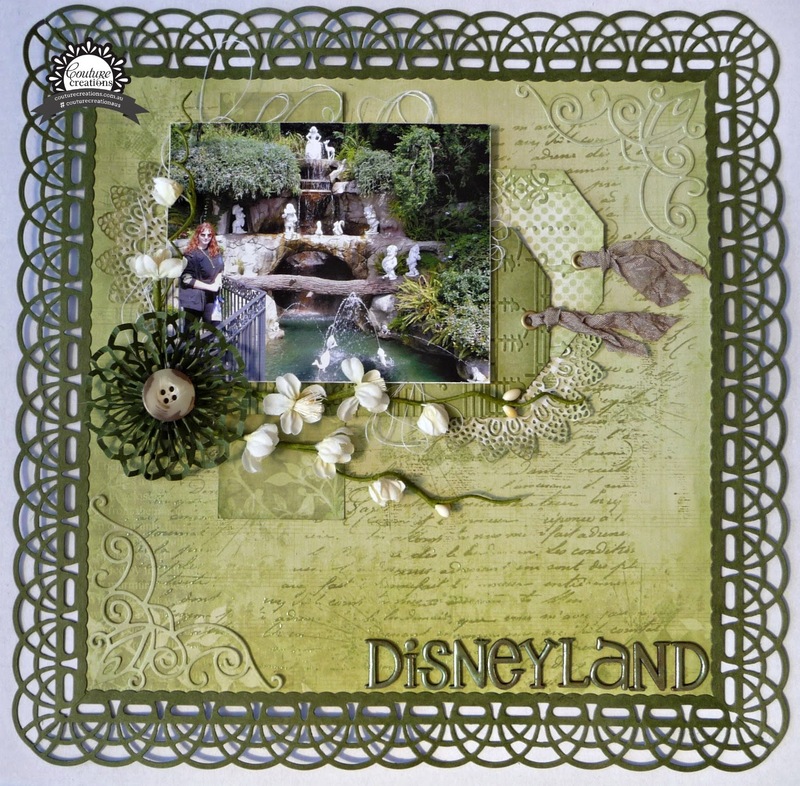 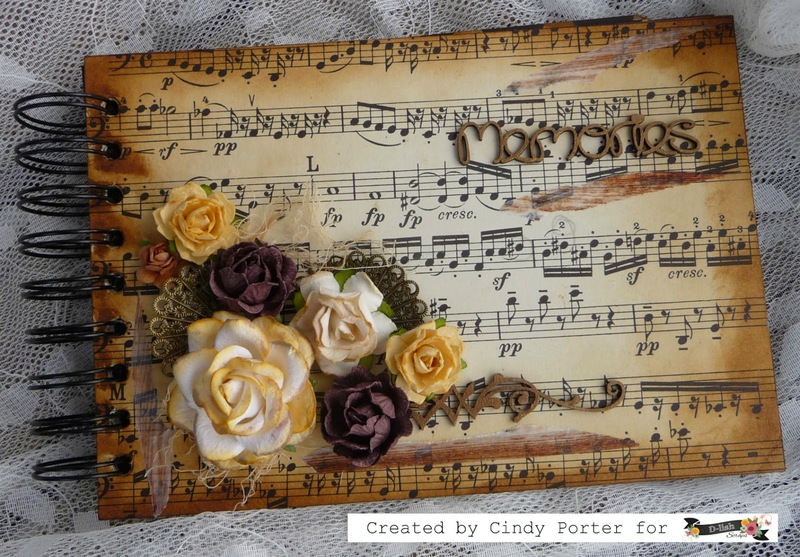 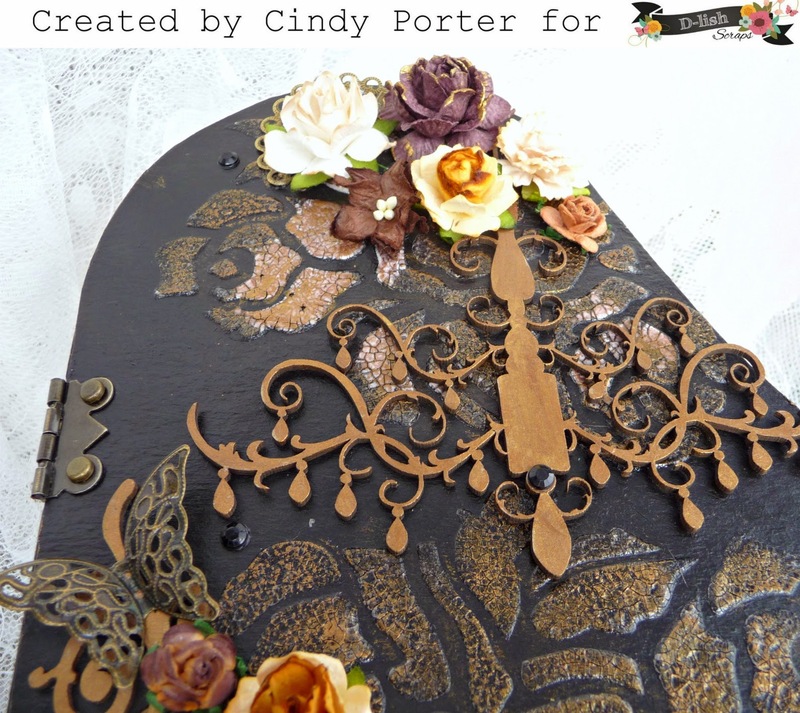 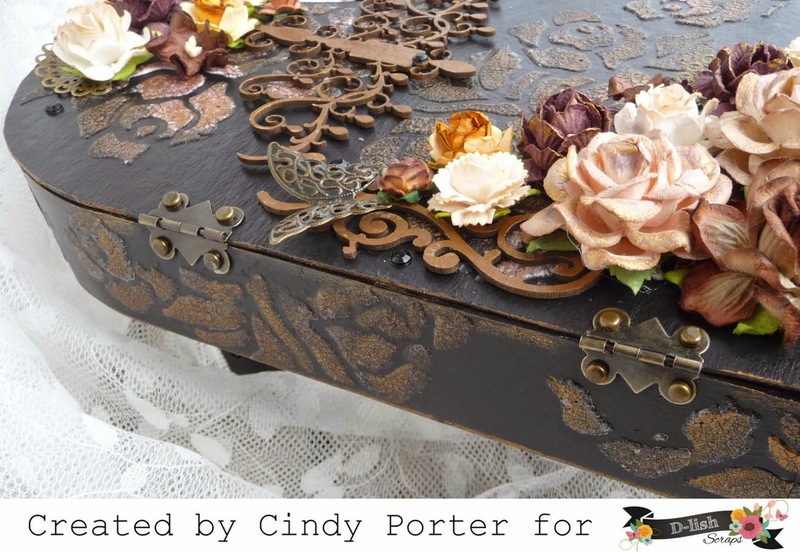 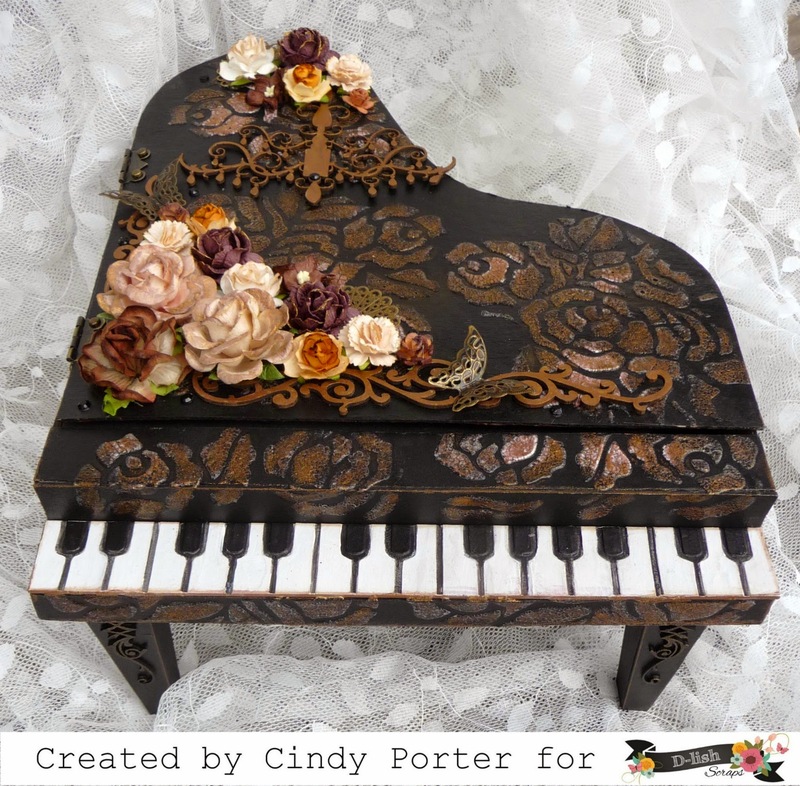 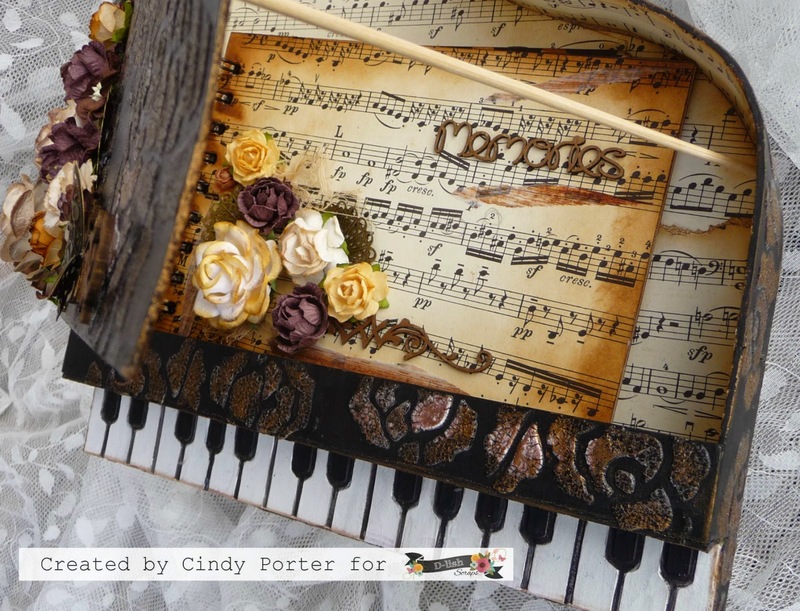 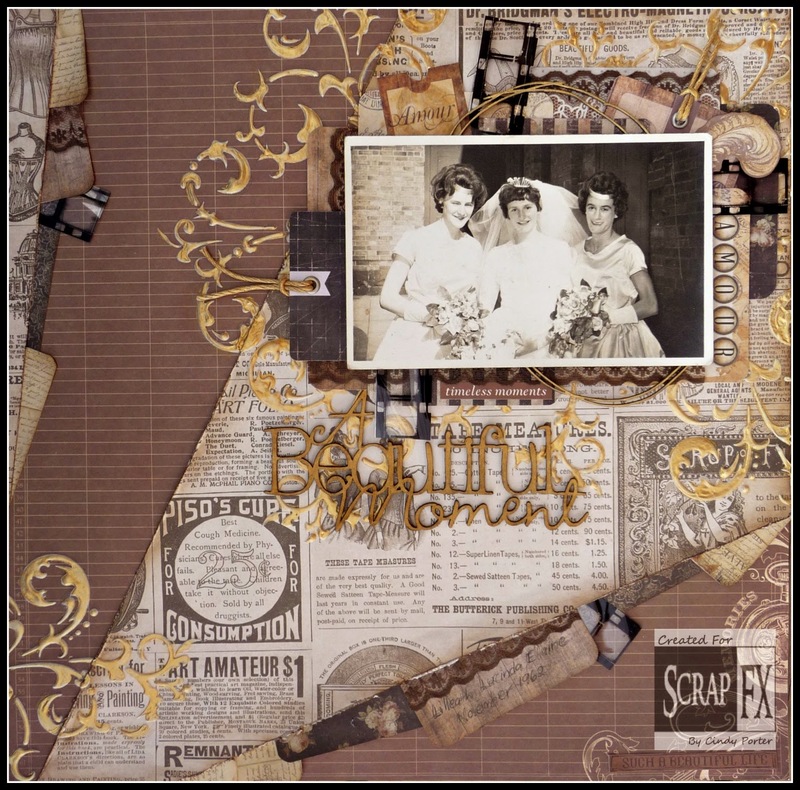 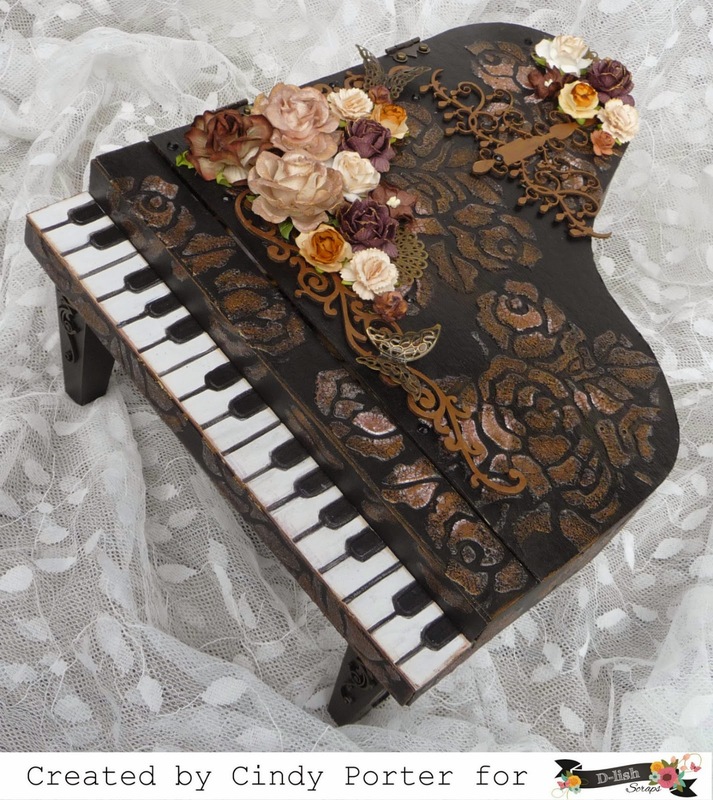 Today I'd like to share with you my latest layout for Scrap FX "A Beautiful Moment"
Hi everyone, it's Cindy here with my very first blog post for Couture Creations.... 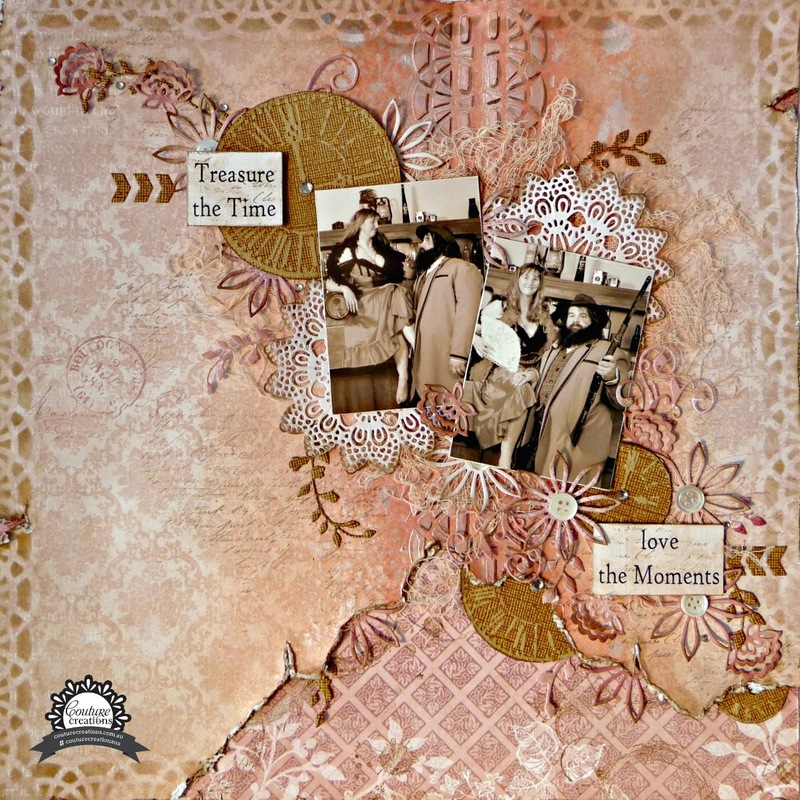 I'm so excited to be here and share my first project using the fabulous Vintage Rose Paper collection and some of this years gorgeous die releases. 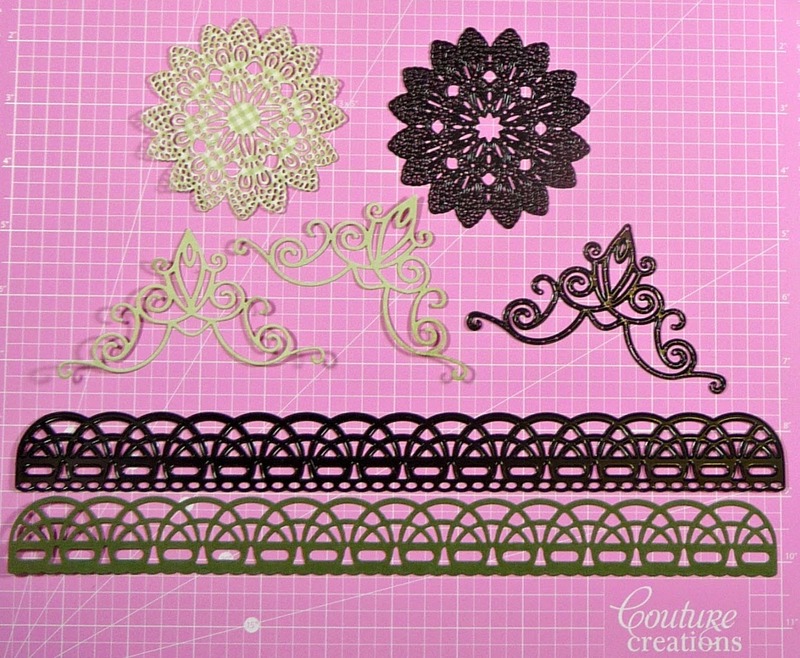 Since being selected for this team, I have learnt something I didn't know about the Couture Creations dies, and no it's not how fabulously they cut, lol, I already knew that.... it is that the majority of them are limited editions... once they are gone they are gone.... so you need to order your favourite dies from your local supplier, asap to make sure you don't miss out! 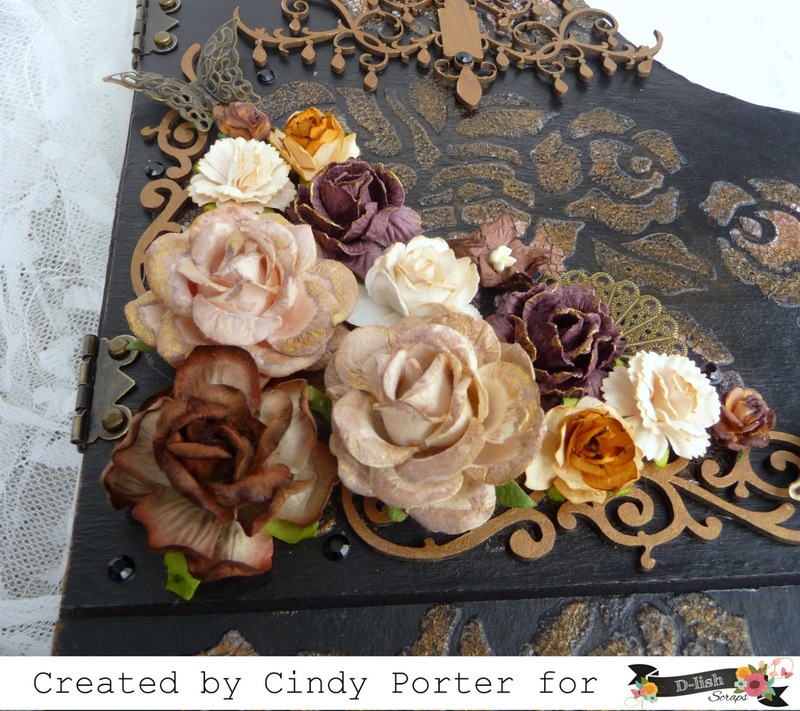 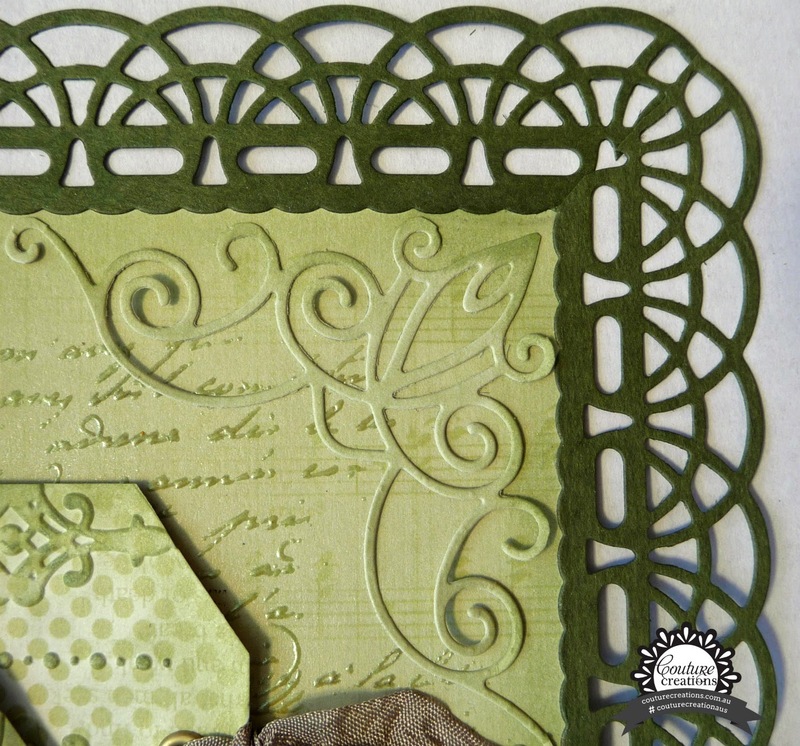 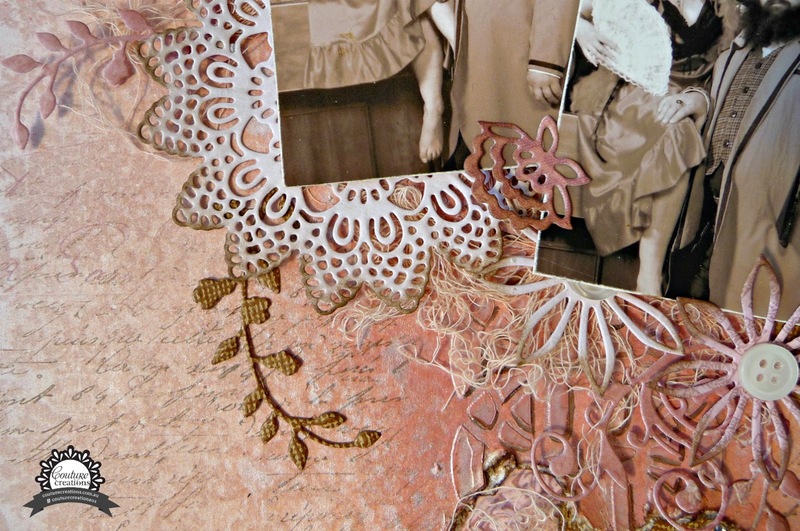 I started by die cutting 5 borders using "Simone's Style" border die from green cardstock, 2 doilies using the "Keepsake Kandy" die from the Vintage Rose paper and 2 decorative corners using the "Malvoisie Corners" die also from the Vintage Rose paper. 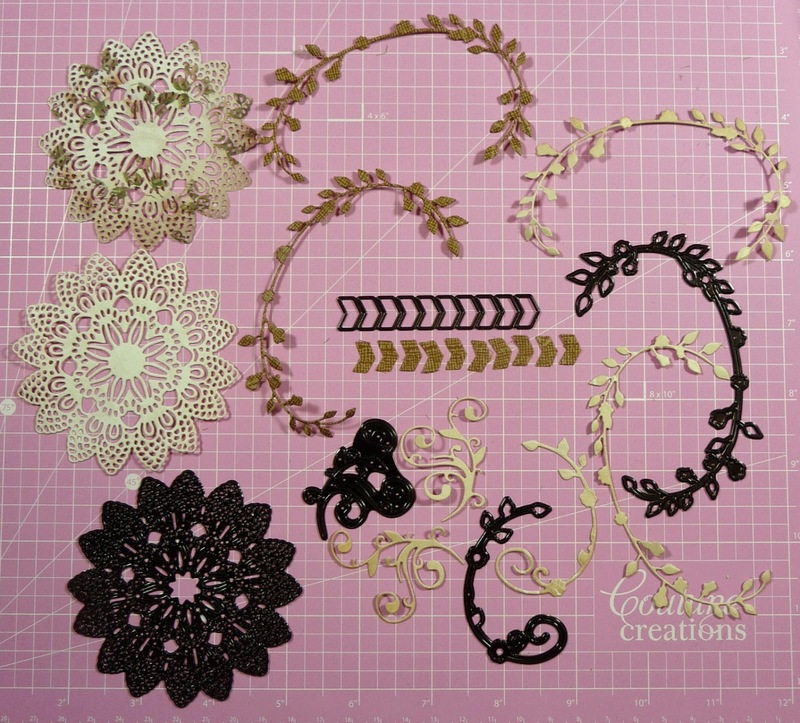 Aren't they just gorgeous.... and sitting on my lovely new cutting mat... 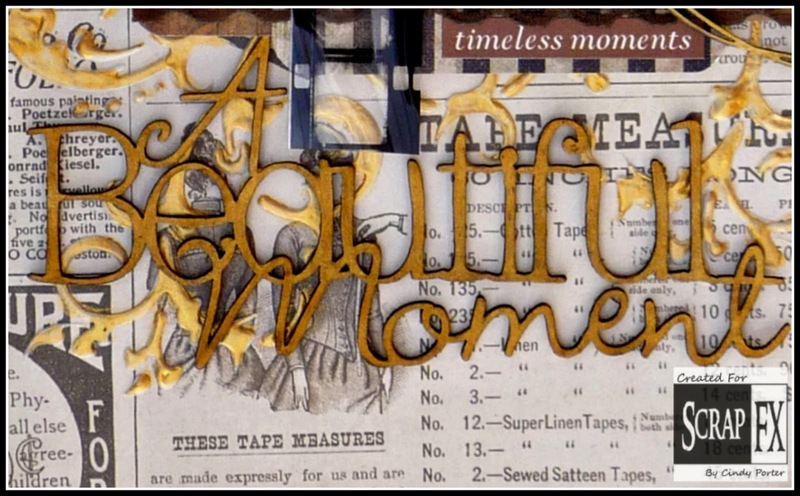 I love that this cutting mat is double sided (black on the other side) and that it has a lovely scalloped edge and is bigger than 12 x12"... and if that isn't enough, it even has inspirational sayings around the edges, simply fabulous. 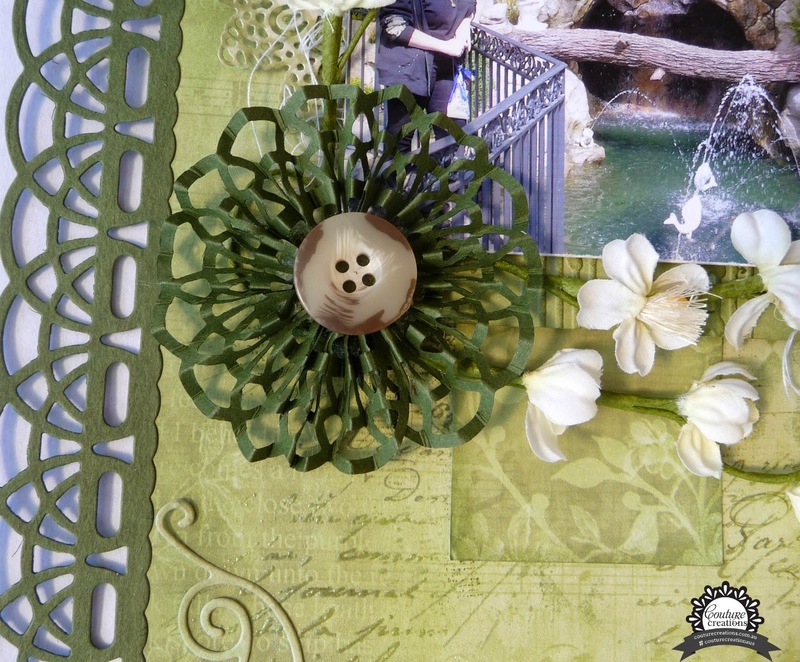 I chose the "green florals" page as by background which I cut down to a 10" square, this let me edge all sides with the die cut border, ensuring to mitre the corners for a neat finish. 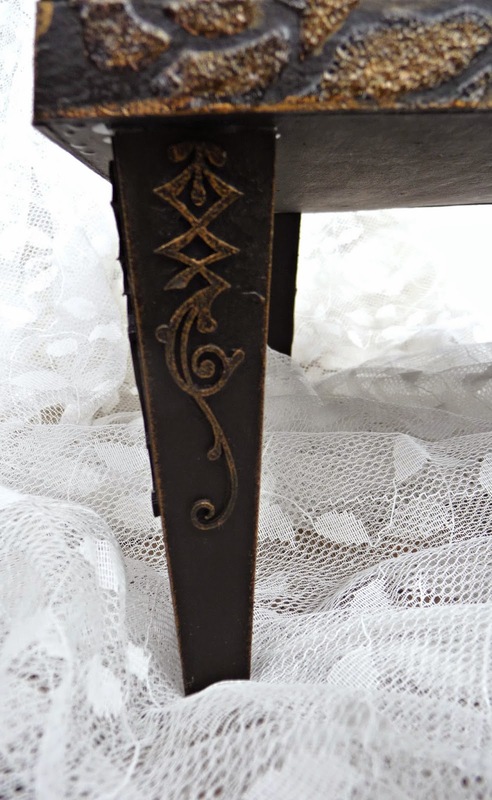 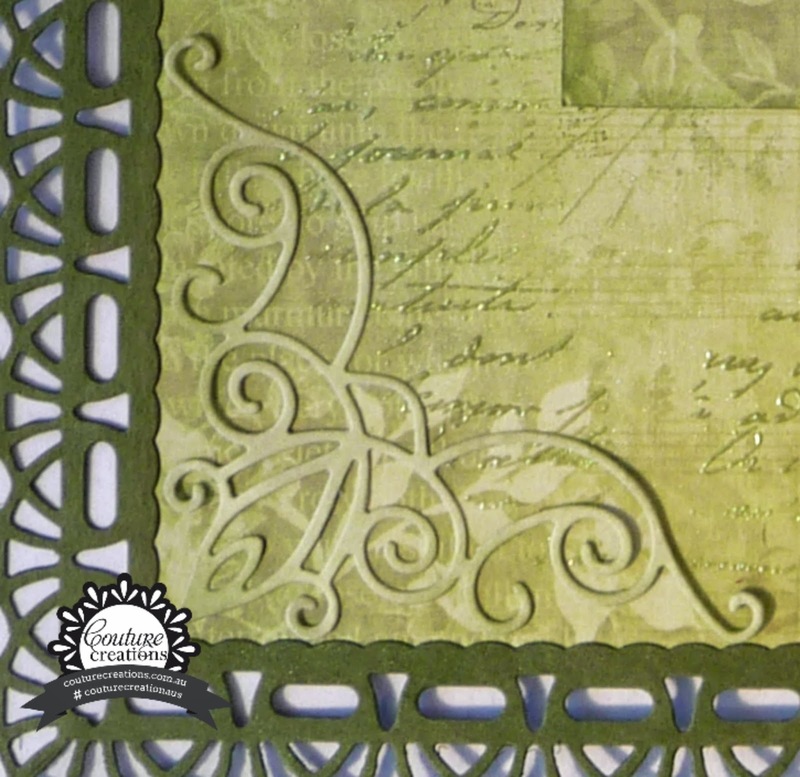 I then clear embossed a script stamp onto the background for a little extra texture. 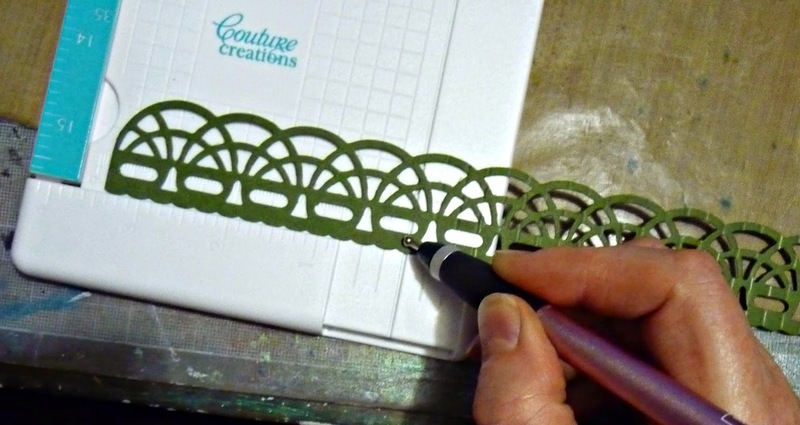 Ok rave over, back to creating a rosette; and as when creating any rosette, gently press the straight edge together in the centre and use a button to hold it all in place.... doesn't this die create a gorgeous rosette.... definitely worth the fiddling with the scoring. 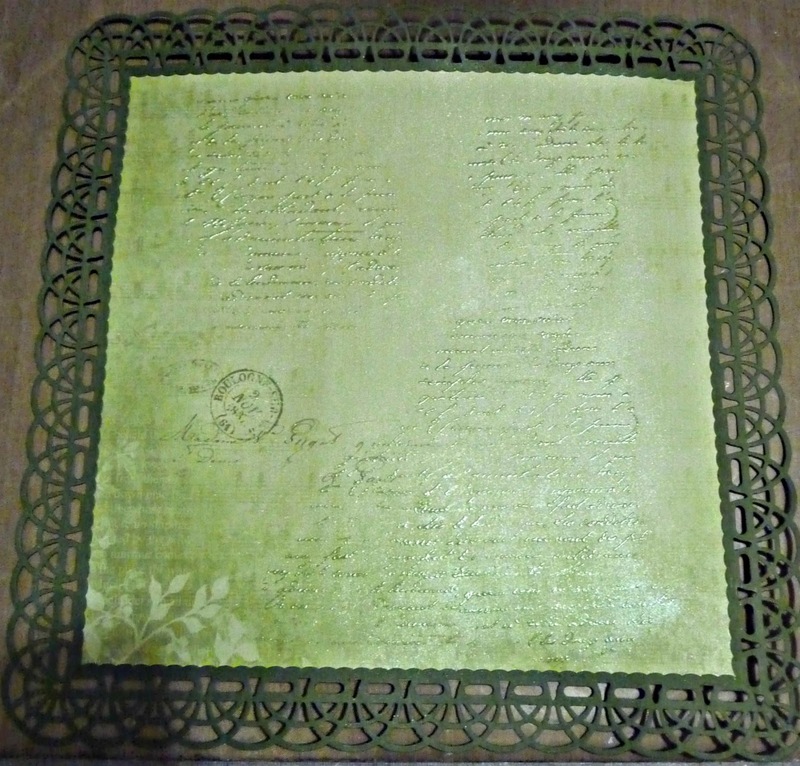 Next I used a couple of the different green printed pages from the Vintage Rose Garden 6x6" pad to create a couple of tags (5 1/2" x 3") and then embossed them using the "Music of the Heart" and the "Lilliputana Curtain" embossing folders. 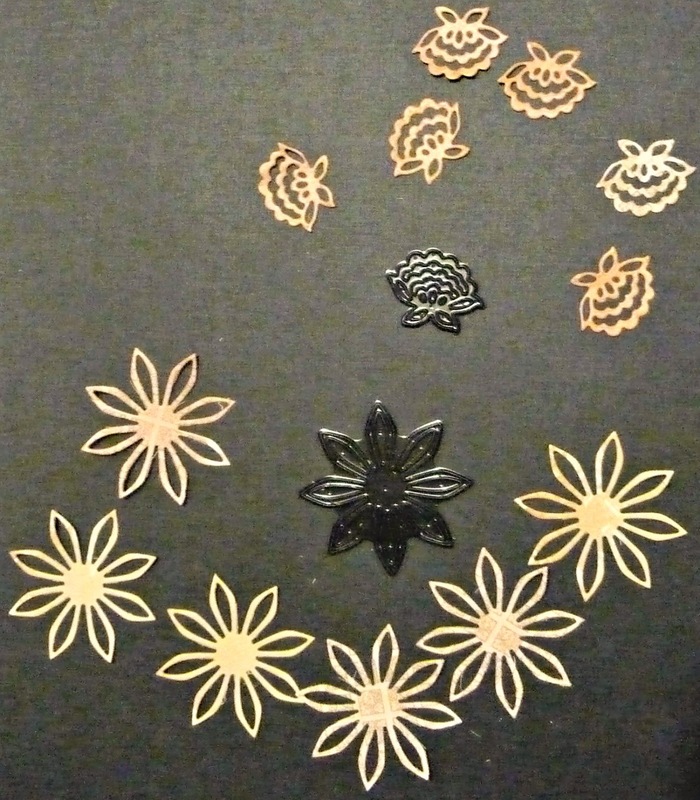 Once embossed I inked them up and put in an eyelet and some ribbon. 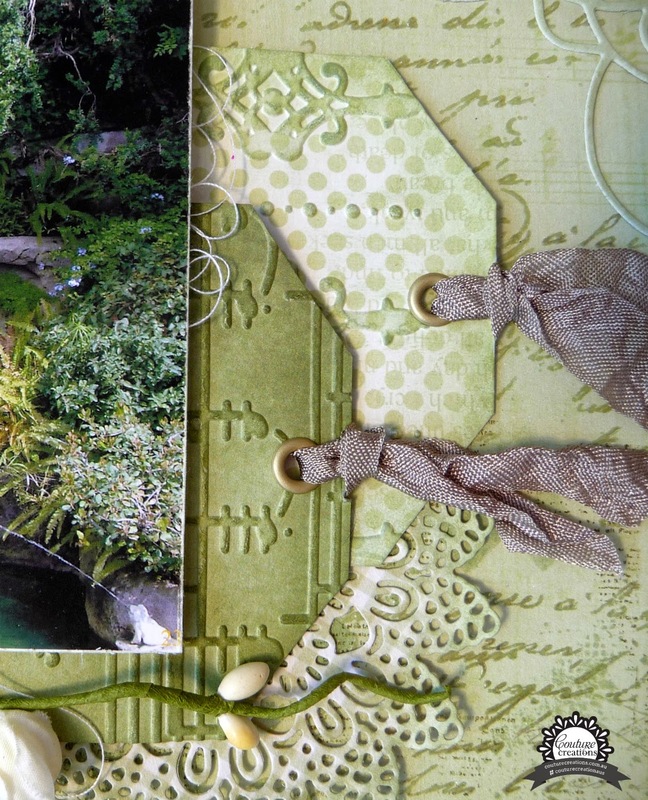 So from here I put my page together. 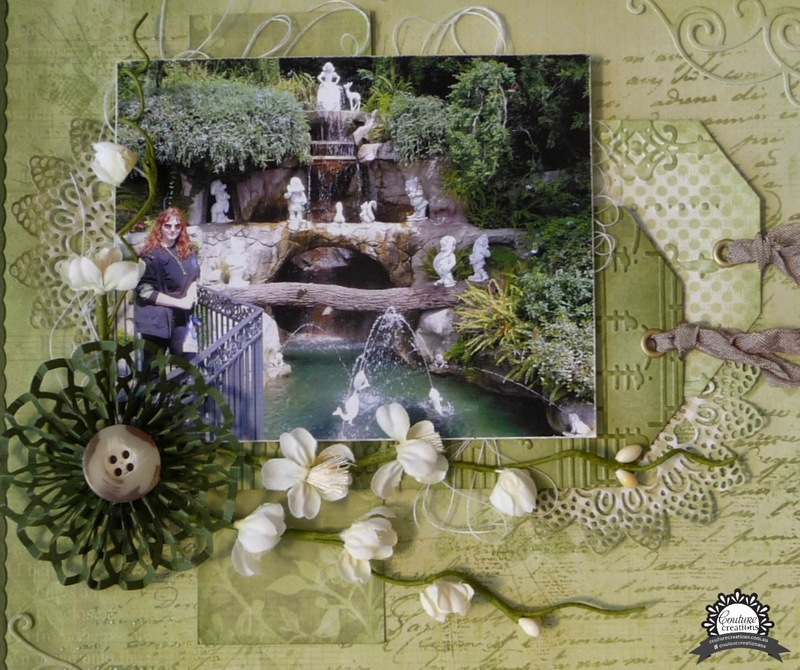 I inked all my pieces using the sponge daubers and bundled sage distress ink, I added some cotton thread underneath my photo and used some 12mm foam tape to mount the music tag and the photo to give some extra dimension to the finished layout. 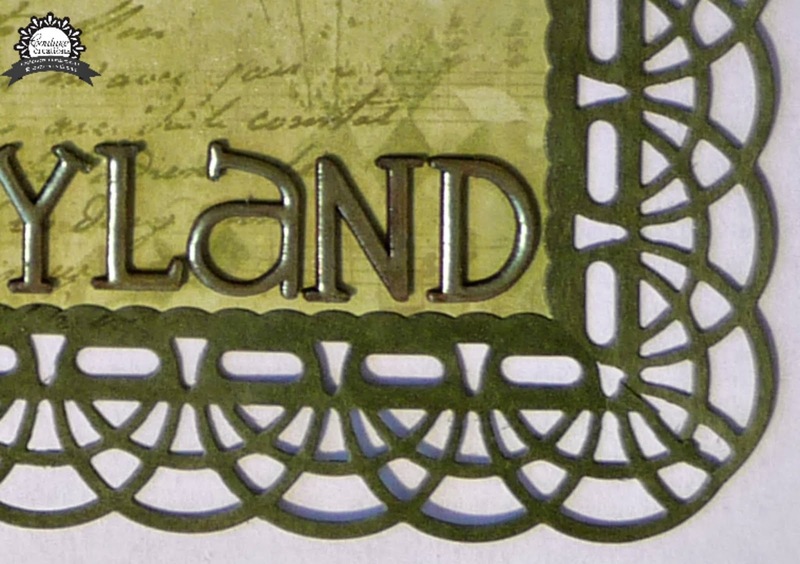 I embossed some chipboard letters to create my title. 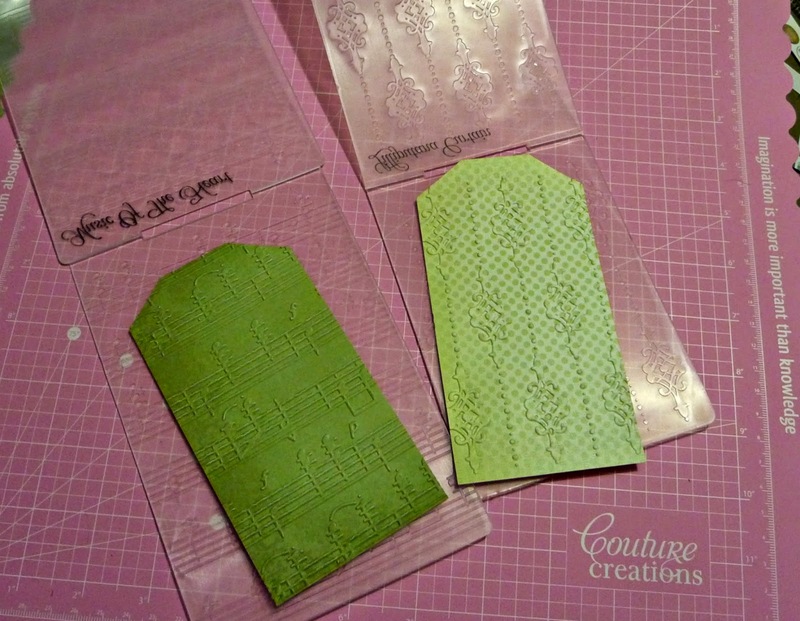 I used the corner die cuts on opposite corners. 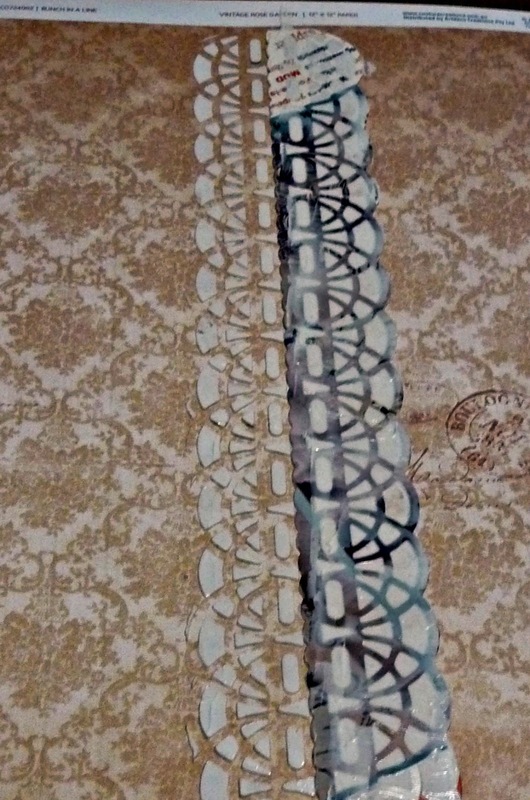 and one last close up of the general placement.